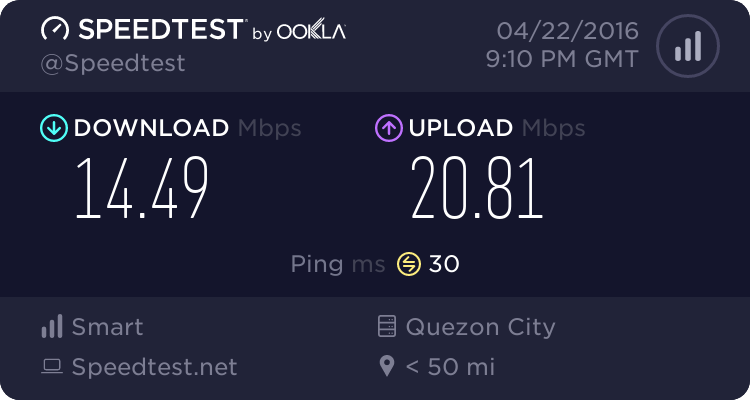 I have been using an Alcatel One Touch Link Y800 LTE pocket wifi since March of 2014 for internet service in our Cebu City condo, in 2014 when it first came out it was flying fast, 2015 it slowed down but was still faster than my PLDT had been, then this year it has slowed down badly to a point which I could put up with because it was still no worse than the 1.5 PLDT we previously had but now they have put a cap of 1GB a day on it, so at 800MB they send a text that I had used 80%, then at 1GB they send a text telling me I had consumed 100% of my daily allowance so it slows down so much that it becomes unusable, thus I have been looking for other fixes. I have read online as much as I could and have friends in the US that use their phones for a hotspot, so I started shopping on Lazada for a phone that I could use as a hotspot and a phone when out and about on LTE and found the ASUS Zenfone2 64 which is flying fast because of the processor etc and works great and now also works great as a Hotspot for me, so now we use up one and then put on the other and between the two, it covers us for 24 hours. I am guessing that Facebook that my wife uses must use a lot of data, and then there is the news which keeps popping up with videos that I have to stop. I had stopped watching most youtubes because I do not wish to use up my allowance of data while here, now I will have to start looking for ways to get even more data, possibly a faster pocket or desktop wifi, ANY SUGGESTIONS? Below is the units I am referring to and the guidelines from Smart. To add, the ASUS is much faster than the pocket wifi. PLDT keeps bugging me to upgrade with their cable package but there's a warning that after you reach a certain amount of data it slows down so I didn't go that route, wonder if you have the package with movies? We have two desk tops and my cell phone connected and we stream stuff all day long our speed is 2 mbps. Well I think I solved my internet problem for now, I bought a Huawei B315s-936 Lte Modem WiFi Router with a Mimo antenna with a Smart LTE kickstart data sim card second hand online and it seems to be working great for now and especially this time of the morning when hardly anyone is on. It should be even faster and more consistent once I get the antenna mounted outside on my balcony railing. Keep us updated on those speeds Lee. I switched to SKY a few months back after ditching PLDT. I'm paying for "up to 8 Mps". 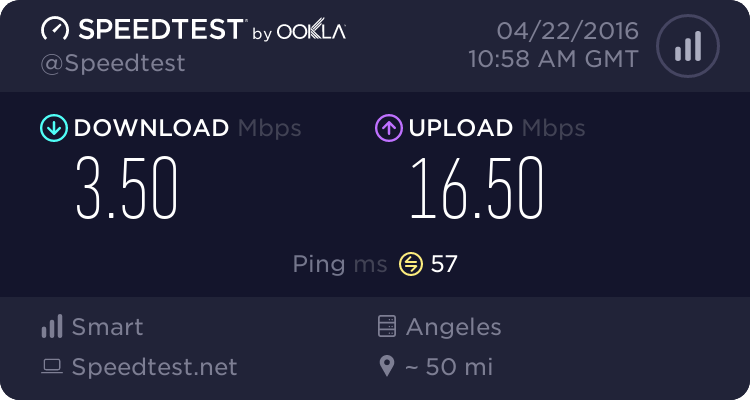 Was working great for about a week and I got the speeds they claimed I would. After a week and a couple nights of large downloads it was throttled back and I'm fortunate to get a consistent 1 Mps. Okay today's update, I reloaded the sim, only had two days free from the guy who sold it to me. I just tested it again and daytime heavy use times it varies in speed but download is usually pretty close to what is showing and upload has always been over 10 the times I checked it, so no where near as fast as it is during low use times, or as fast as it could be if I was closer to the tower but it is still way faster and more reliable, so far than my PLDT ever was, time will tell, below is a test I just did. I am especially happy with this setup for our back and forth lifestyle, as we are not here all year but in the past were paying p1650 a month every year for 6 years paying for the many months we were not here and a few times when we got back, no internet or phone, so for those who live here full time, then it may or may not be worth it for you, but either way, first you would definitely have to make sure that you are close to a LTE tower site. Should any member decide to go with this type of setup, let me know in a personal message and I may be able to give you a tip on how to hopefully make it work a little better for you. This mornings speed test, so it is consistently this or better on off use hours. do you have a data cap daily and monthly and whats your monthly cost going to be ? Yes there can be a daily limit of 800mb a day, it cost p995 a month. There are so many prepaid plans, this would not be for everyone but it works great for us and our use. One way I was beating the cap was using two devices with two different sim cards so double the daily limit. Again before I forget, your area would have to have an LTE tower close by or these would not work well. Those dl / ul speeds are quite high. I had an LTE sim from globe. I only actually used a globe surf promo once when I went down house hunting in Cavite/Laguna. I never picked up LTE speeds down there on the road so I wasn't too impressed with the LTE service. The new place where my family is moving to next month has a PLDT service box right outside on the pole so we'll most likely go with that. I'll have ask my wife what the speeds are when she moves down there. not sure where your moving too or your needs but every one has daily data caps now the only one i found no cap still is sky and for the most part decent service for costs. Living in Garden Villas3, City of Santa Rosa, Laguna. speeds are awesome. Faster on my mobile and tablet. My desktop has to have a usb thing plugged in to talk to the modem/router. I have never seen the world brighter and less prosperous. I wish they had that here in Cebu but also at a reasonable price. We still have our PLDT Plan 999 with the 3.5Mbps and still working fine for what we need to do. 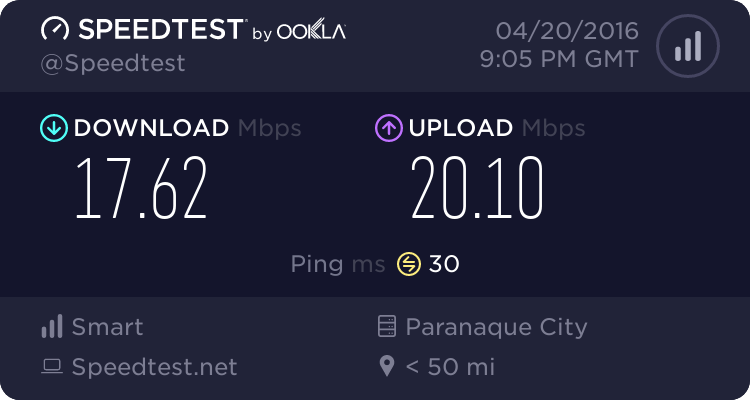 It'll be a long time in coming before we ever consider upgrading to the Unlimited PLDT Home Fiber. No need to fix what isn't broken. Update, I am still using the same basic system and it is still working well but I have to do a little more work to keep my speeds up, since they slow down once I reach the data cap each day, so I have found that if I load for a day or a week then I do not seem to hit the data cap, yet if I load for 30 days, I seem to hit the data cap all the time, I have to wonder if Smart knows they have me when I sign up for 30 days but when I sign up for a day or a week at a time they are not so sure and especially when Globe offers similar plans. I also made a post HERE:New Smart LTE home device with 700 mhz and so far that device seems to be working well, quite possibly better than my home Hauwei device that has an outdoor antenna on it. I have the same plan as Art except I added the land line and there's no data cap limits, my cost is 1800 pesos per month, I use DSL, I've had PLDT for 4 years. If your using a thumb drive or one of those antenna's and tower it's always gonna have some sort of data cap and bad service, or bundled plan with cable TV, just my own personal experience. PLDT keeps bugging me to upgrade to cable TV but that will have data caps so I won't change my service either. Those horrible thumb attachments to the computer or laptop don't work in our area but could work in larger cities.